I might be lynched by the whole middle-earth fan club. This is what I wrote on my FaceBook months ago. Saw it today at the cinema … And what a disappointment ! Throw together the “Lord of rhe Rings” films. Shake them well and use the magisterial scenery, the compelling soundtrack and the magic of the world of Tolkien. Include some recycled scenes that didn’t make it through the final editing, update sequences of the best action scenes and voila … we’re off for a 3-part marathon session again. In other words, the same old stuff dressed up in new clothes. It remains a mystery to me how they managed to make such a long movie from such a tiny little book. Wild guess … pure profit ! So Peter Jackson, shame on you. You’ve fallen for the big bucks … yeak! I saw it afterwards once again and I still have the same opinion. Beware … I’m an avid “Lord of the Rings” fan and admirer. I’ve seen all movies in the cinema. Experienced a marathon session once. I bought the extended version DVD box to watch it at home yearly (Even watch it when I’m sick). In other words, for me this is THE movie of all movies for the following centuries. No other movie can top this one ever. 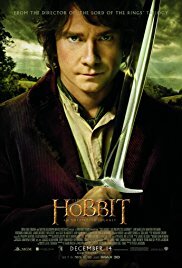 But when I heard that “The Hobbit” was about to be released and that it was a sort of prequel to “The Lord of the Rings“, the only thing I could say was “Oh come on” ! The same thing I had with the Star Wars saga. I saw the first film when I was very young. And afterwards I left the cinema completely overwhelmed by it. It was mindblowing. The same applies to the next two sequels. And then they start with prequels on the sequels. And sequels on the prequels. And trust me, there wile be preprials on the semi-sequels. I mean, for me it’s a bit too much. After “Episode I” I just ignored the whole Star Wars stuff. I really wanted to see “The Hobbit“. But only because I am devoted to everything that has to do with fantasy. And because I knew that I would be enchanted by that wonderful world of Tolkien. But time and time again those dollar signs flashed before my eyes … regrettably.